MFT Creative Challenge: In the Background | A bit of this. A bit of that. Got a card to share with you today! 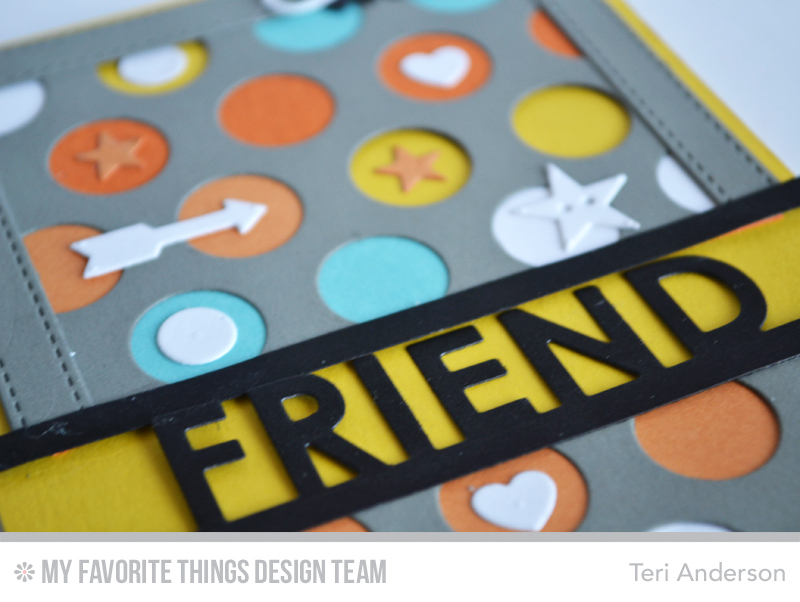 Took part in the latest Creative Challenge with the My Favorite Things Design Team. Our challenge was to come up with ways MFT’s products could be used to create eye-catching backgrounds. So yeah. 🙂 Here’s what I came up with. I’m a big fan of My Favorite Things’ Cover-Up Die-namics. I use them a lot because they just plain make good backgrounds. I whipped out one of my favorites for this card, the Jumbo Dots Cover-Up. I cut it from a gray cardstock and then put strips of cardstock behind many of the openings. Then to give the openings a little visual interest, I added some small shapes from the Blueprints 8 Die-namics. I think the circles some ways it reminds me a little bit of the look of some of those Flair buttons folks make. That Friend word? It too is from Blueprints 8. I gave it a different look by adding a long strip of cardstock over the top of it. It sorta reminds me of the look of this Friend Die-namics die. Make sure you swing by the MFT Blog to see who else tackled this month’s challenge. And, you know, thanks for for swinging by here! I always enjoy seeing you did! This is really neat. Love the colour combo.